Mice are a favorite thing in our house right now. It seems as though the last few movies we watched all contain a mouse/rat character. 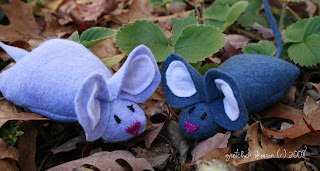 I wanted to make little mouse friends for the boys. I think I'm going to make more animals. It was so much fun and I think they are so stinkin' cute! I'd love to make one of those with catnip inside for Tati. She'd go nuts and maybe she'd leave my yarn alone. Maybe. They still would be cute. So cute! We've had a mice thing here too, but unfortunatly it's because my boy saw one run across the kitchen! yuck. he'd love one of these though. Gretchen, you are so talented and so creative. I would love to get one of these for Luke and Bridget (one blue and one pink, of course)! I also like the "sponges" and would like to give those a try, too! Let me know what I need to do. Love them. Although I'm still a little scared of mice since I had an invasion in my Queens apartment. I couldn't even watch Ratatouie.